The robotic probe Spirit has sent back its first colour images of Mars. The pictures of the dusty and rocky surface are the most detailed ever obtained by a lander on the planet. US space agency scientists report that the rover is in excellent health as they continue to prepare it for its mission to explore Gusev Crater. The European Space Agency will make an attempt on Wednesday to contact the missing British-built lander Beagle 2 with its mothership Mars Express. The US space agency, Nasa, has announced that Spirit's landing site will be named the Columbia Memorial Station, in honour of the of seven crew who died in last February's space shuttle disaster. Describing the first colour images from Spirit, Jim Bell, of Cornell University and a member of the mission science team, said he was knocked out by their quality. "I am in shock and awe," he told a media conference at Nasa's Jet Propulsion Laboratory in Pasadena, California. "We designed [Spirit] to do this so we shouldn't be surprised but it's spectacular detail." 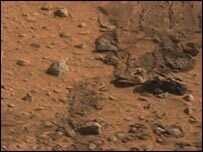 Nasa unveiled one main image of the surface of Mars. It showed a plain full of small boulders and dust. The image was actually a mosaic of 12 separate pictures shot by Spirit's high-resolution panoramic camera, or Pancam. It covered a 45-degree field of view of the terrain in Gusev Crater, where Spirit landed on Sunday at 0435 GMT. "Pancam has 20-20 vision. 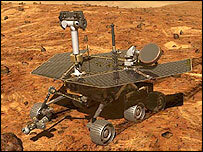 It is three to four times better than any mission that has gone to Mars before," said Dr Bell. "This is a glimpse of the detail we're seeing at just this one little wedge in front of the rover. We've still got the entire terrain around to build up at this kind of resolution." The lead scientist on the rover mission, Dr Steven Squyres, also from Cornell, said "trenching into this stuff will be an absolute blast". "The surfaces of the rocks are remarkably smooth and the shapes are quite varied; some of them quite rounded and some of them quite angular," he added. He speculated from the "tails" of dust in their shadows that the rocks had spent a long time in an extremely windy environment. "This tells us nothing about the composition of these rocks," he said. "That is all to come." The researchers said it would take some time to receive all the data to put together a colour panorama of the landing site - similar to the black and white 3D panorama taken by Spirit's stereo cameras and released on Monday. Scientists hope the rocks shown in the pictures will help them understand the planet's past climate. They will use Spirit to drill into the boulders to see if they have come into contact with water at any time in the geologic past. Gusev Crater appears, from images taken by orbiting spacecraft, to have held a lake at one time. The mission team has already selected one target to investigate, a dusty depression they have nicknamed "Sleepy Hollow". 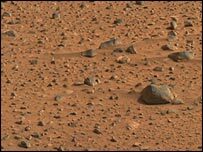 It lies about 12 metres (40 feet) from where the rover landed. Spirit, which is the size of a golf buggy, touched down on Mars in what scientists believe was a near-perfect landing with giant airbags as cushions. It will be joined in late January by an identical rover called Opportunity, which will land on the far side of the planet. As Nasa scientists presented the colour pictures, researchers connected with the British-built Beagle lander were preparing for a critical day in their search for their missing probe. The tiny robot has not been heard from since its presumed landing on the Red Planet on Christmas Day. Numerous attempts to communicate with Beagle through the US satellite Mars Odyssey and radio telescopes on Earth have all failed. European Space Agency controllers will send Beagle's mothership, Mars Express, over the landing zone at 1213 GMT on Wednesday. Mother and baby were designed specifically to "talk" to each other and the hope is that a contact between them will succeed where other communication attempts have not. If Mars Express cannot find Beagle, the lander mission will be classed as lost. "Britain's Beagle team have yet to receive such a comforting view"